Cave bear is the common name for a large bear, Ursus spelaeus, that lived in Europe during the Pleistocene about 250,000 years ago and became extinct at the end of the last ice age about 12,000 years ago. Both the common name, cave bear, and the scientific name, spelaeus, derive from the fact that fossils of this species were found mostly in caves, suggesting that this species spent more time in caves than the related brown bear, which only uses caves for hibernation. 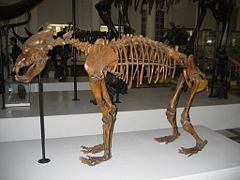 As a result of its habitat, Ursus spelaeus is the species of macro fauna that has resulted in the largest amount of Pleistocene fossils in caves (Orlando et al. 2002). Human beings have long been fascinated by their own history, and cave bears have shared part of that history, living at the same time as modern human beings (Homo sapiens sapiens) and the Neanderthals. Many mysteries remain about the cave bear and about its interaction with humans, which remain active foci of human inquiry, including the employment of new technologies such as DNA analysis (Noonan et al. 2005). The cave bear, Ursus spelaeus, was prominent during the Pleistocene. The Pleistocene epoch of the geologic timescale is the period from 1,808,000 to 11,550 years Before Present (BP). The Pleistocene follows the Pliocene epoch and is followed by the Holocene epoch. The end of the Pleistocene corresponds with the end of the Paleolithic age used in archaeology. Cave bears inhabited Europe and the Near East since the Riss glacial period, 250,000 years ago (Orlando et al. 2002). They became extinct approximately 12,000 years ago, at the end of the last glacial period (Orlando et al. 2002). The cave bear's range stretched across Europe, from Spain to Eurasia, from Italy and Greece to Belgium, the Netherlands and possibly Great Britain, across a portion of Germany, through Poland, then south into Hungary, Romania, and parts of Russia. There have been no traces of cave bears living in northern Britain, Scandinavia, or the Baltic countries, which were covered in extensive glaciers at the time. The largest numbers of cave bear remains have been found in Austria, Switzerland, southern Germany, northern Italy, northern Spain, Croatia, Hungary, and Romania. The huge number of bones found in south, central, and east Europe has led some scientists to think that Europe may have once had literal herds of cave bears. Some, however, point out that though some caves have thousands of bones, they were accumulated over a period of 100,000 years or more, thus requiring only two deaths in a cave per year to account for the large numbers (Bieder 2005). The cave bear inhabited low mountainous areas, especially in regions rich in limestone caves. They seemed to avoid open plains, preferring forested or forest-edged terrains (Bieder 2005). Many caves in Europe have skeletons of cave bears on display, for example the Heinrichshöhle in Hemer or the Dechenhöhle in Iserlohn, Germany. In Romania, there is a cave called Peştera Urşilor (bears' cave) where numerous cave bear skeletons were discovered. The cave bear was a massive bear, characterized by a very broad, domed skull with a steep forehead, unlike the more gradual sloping forehead in skulls of modern bears. Cave bears of the last ice age lacked the usual two to three premolars present in other bears; to compensate, the last molar is very elongated, with supplementary cusps (Altabadia). The cave bear's stout body had long thighs, massive shins, and in-turning feet, making it similar in skeletal structure to the grizzly bear. The average weight for males is estimated to have been 400 kilograms (880 pounds) (Brown 1993). Certain experts suggest greater weights of 500-600 kilograms (1,102-1,323 pounds) (Pastoureau 2007). The modern brown bear, Ursus arctos, weighs between 130 and 700 kilograms (286-1540 pounds), with the larger populations matching the polar bear, Ursus maritimus (300 to 600 kilograms) (660 to 1320 pounds) as the largest extant bear. Males were larger than females. About ninety percent of cave bear skeletons in museums are male, due to a misconception that the female skeletons were merely "dwarfs." Cave bears grew larger during glaciations and smaller during interglacials, probably to adjust heat loss rate (MacDonald 1992). The dietary habits of cave bears—whether largely vegetarian, or also carnivores or scavengers—is unsettled. The morphological features of chewing apparatus of cave bears suggest herbivorous behavior, rather than predatory behavior, and important adaptations to a tough vegetarian diet (Pinto Llona 2006). On the other hand, comparison with extant European brown bears, Ursus arctos, in terms of gross-wear features on the teeth, suggests that tubers were absent from the cave bear diet and not responsible for the extreme wear seen in cave bear teeth (Pinto Llona 2006). Dental Microwear Analysis (DMA), comparing diet-related microscopic dental wear features of brown bears, whose diet is known, with cave bears suggests that the cave bear dietary behavior included a greater consumption of bone versus that of brown bears. Results obtained on the stable isotopic yield of cave bear bones also are interpreted as indicators of a largely vegetarian diet, and one even more vegetarian than contemporary herbivorous taxa (Bocherens et al. 1994; Pinto Llona 2006). The bones of central and western European cave bears matched those of vegetarians in having low levels of nitrogen-15, which is accumulated by meat eaters. However, several cave bear sites in the Peştera cu Oase in the southwestern tip of the Carpathian mountains have shown that the cave bears of that region may have been largely carnivorous, due to higher levels of nitrogen-15 in their bones (Choi 2008). Nitrogen-15 is accumulated by animals and, thus, carnivores, which eat animals, accumulate more nitrogen-15 in their bodies than do herbivores. Carnivorous behavior is also evident from very large cave bear tooth marks on young cave bear skulls in Yarimburgaz Cave in western Turkey (Choi 2008). Taphonomic analysis of modifications on cave bear bones produced by carnivores suggests that in addition to their herbivorous and carnivorous behaviors, cave bears actively scavenged on the carcasses of their con-specifics (Pinto Llona 2006). It is possible that different populations of cave bears had different dietary habits, including possible bear-bear cannibalism (Choi 2008) and cannibalistic scavenging behavior. 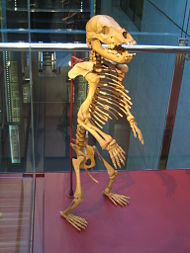 In the case of the central and western European populations, whose bones lacked an identifiable isotopic signature of nitrogen-15, it is possible that cannibalistic scavenging behavior may have been quite limited, relative to the more dominant vegetarian diet, leaving no trace (Pinto Llona 2006). Cave bear longevity is unknown, though it has been estimated that they seldom exceeded 20 years of age (Bieder 2005). Some cave bear bones show signs of numerous different ailments, including fusion of the spine, bone tumors, cavities, tooth resorption, necrosis (particularly in younger specimens), nematodes, osteomyelitis, periostitis, rickets, and kidney stones (Brown 1993). Male cave bear skeletons have been found with broken baculums, probably due to fighting during breeding season (Bjorn 1968). Death during hibernation is considered to have been a common end for cave bears, mainly befalling specimens that failed ecologically during the summer season through inexperience, sickness, or old age (Bjorn 1968). Paleontologists doubt adult cave bears had any natural predators, save for pack hunting wolves and cave hyenas, which would probably have attacked sick or infirm specimens (Bieder 2005). Cave hyenas are thought to be responsible for the dis-articulation and destruction of some cave bear skeletons. Such large carcasses would have been an optimal food resource for the hyenas, especially at the end of the winter, when food was scarce (Diedrich and Zak 2006). Skull of Ursus spelaeus. Cave bears lack the usual two to three premolars present in other bear species. The cave bear is thought to be descended from the plio-pleistocene Etruscan bear (Ursus etruscus) through the Deninger's bear (Ursus deningeri) of the Pleistocene half a million years ago. Cave bears found in different regions vary in age and evolutionary advancement, thus facilitating investigations into their development. The three anterior premolars were gradually reduced, then disappeared. In a fourth of the skulls found in the Conturines, the third premolar is still present, while the other more evolved specimens elsewhere lack it. The fourth premolar developed into a molar. The last remaining premolar became conjugated with the true molars, enlarging the crown and granting it more cusps and cutting borders. This phenomenon known as molarization improved the mastication capacities of the molars, facilitating the processing of tough vegetation. This allowed the cave bear to gain more energy for hibernation while eating less than its ancestors (Altabadia). Molecular phylogenetic analysis of mtDNA suggests that cave bears and brown bears separated from a common ancestor about 1.2 to 1.6 million years ago (Orlando et al. 2002). Experts generally agree on the time of the extinction of the cave bear—about 12,000 years ago at the end of the late glacial period (Orlando et al. 2002)—but they remain in dispute about the causes of the extinction. Some have proposed that the bears' large size and lack of natural predators caused them to degenerate as a species, while others claim that habitat loss due to climate change was responsible for the extinction. Yet another group of experts disputes this claim, as the cave bears had earlier survived multiple episodes of climate change. In their key article on ancient DNA and the population genetics of the cave bear, Orlando et al. (2002) note that climatic changes may have altered the bears' genetic diversity profiles in ways that pushed the bears to their extinction. They note that the cave bear started to become extinct during cold climatic conditions accompanied by an observed simultaneous and significant loss of genetic diversity. Overhunting by humans has been largely dismissed due to the fact that human populations at the time were too small to pose a serious threat to the cave bears' survival, though there is proof that the two species may have competed for living space in caves. One theory proposed by late paleontologist Bjorn Kurten states that the cave bear populations were fragmented and under stress even before the advent of the glaciers (Bieder 2005). Collections of bear bones at several widely dispersed sites suggest that Neanderthals may have worshiped cave bears, especially at Drachenlock, in Switzerland, where a stone chest was discovered with a number of bear skulls stacked upon it. Neanderthals, who also inhabited the entrance of the cave, are believed to have built it. A massive stone slab covered the top of the structure. At the cave entrance, seven bear skulls were arranged with their muzzles facing the cave entrance, while still deeper in the cave, a further six bear skulls were lodged in niches along the wall. Next to these remains were bundles of limb bones belonging to different bears. Consequently, it was at this site that the supposed symbol of the "Cult of the Cave Bear" was found. This consisted of the skull of a three-year-old bear pierced in the cheek area by the leg-bone of younger bear. The arrangement of these bones of different bears are not believed to have happened by chance. The unusual finding in a deep chamber of Basua Cave in Savona, Italy, is thought to be related to cave bear worship, as there is a vaguely zoomorphic stalagmite surrounded by clay pellets. It was apparently used by Neanderthals for a ceremony, the fact that bear bones lay scattered on the floor further suggested that this was likely to have had some sort of ritual purpose (de al Cova). Altabadia. n.d. Gli orsi spelèi delle Conturines. Altabadia. Retrieved April 18, 2008. Bieder, R. 2005. Bear. London: Reaktion. ISBN 1861892047. Kurten, B. 2007. Pleistocene Mammals of Europe. New Brunswick, N.J.: AldineTransaction. ISBN 0202309533. Bocherens, H., M. Fizet, and A. Mariotti. 1994. Diet, physiology and ecology of fossil mammals as inferred from stable carbon and nitrogen isotope biogeochemistry: implications for Pleistocene bears. Palaeogeography, Palaeoclimatology, Palaeoecolology 107: 213-225. Brown, G. 1993. Great Bear Almanac. New York: Lyons & Burford. ISBN 1558212108. Choi, C. O. 2008. Prehistoric cave bears weren't so cuddly after all. FOXNews, January 9, 2008. Retrieved April 18, 2008.
de la Cova, C. M. n.d. Burial, ritual, religion, and cannibalism. Neandertals.com. Retrieved April 18, 2008. Diedrich, C. G., and K. Zak. 2006. Prey deposits and den sites of the Upper Pleistocene hyena Crocuta crocuta spelaea (Goldfuss, 1823) in horizontal and vertical caves of the Bohemian Karst. Bulletin of Geosciences 81(4): 237-276. Macdonald, D. 1992. The Velvet Claw. BBC Books. ISBN 0563208449. Noonan, J. P., M. Hofreiter, D. Smith, J. R. Priest, N. Rohland, G. Rabeder, J. Krause, J. C. Detter, S. Pääbo, and E. M. Rubin. 2005. Genomic sequencing of Pleistocene cave bears. Science 309(5734): 597-599. Orlando, L., D. Bonjean, H. Bocherens, A. Thenot, A. Argant, M. Otte, and C. Hänni. 2002. Ancient DNA and the population genetics of cave bears (Ursus spelaeus) through space and time. Molecular Biology and Evolution 19:1920-1933. Retrieved April 18, 2008. Pastoureau, M. 2007. L’ours; Histoire d’un roi dechu. Paris: Seuil. ISBN 202021542X. Pinto Llona, A. C. 2006. Comparative dental microwear analysis of cave bears Ursus spelaeus Rosenmüller, 1794 and brown bears Ursus arctos Linnaeus, 1758. Scientific Annals, School of Geology Aristotle University of Thessaloniki (AUTH), Special volume 98: 103-108. Retrieved April 18, 2008. This page was last modified on 20 August 2008, at 18:37.